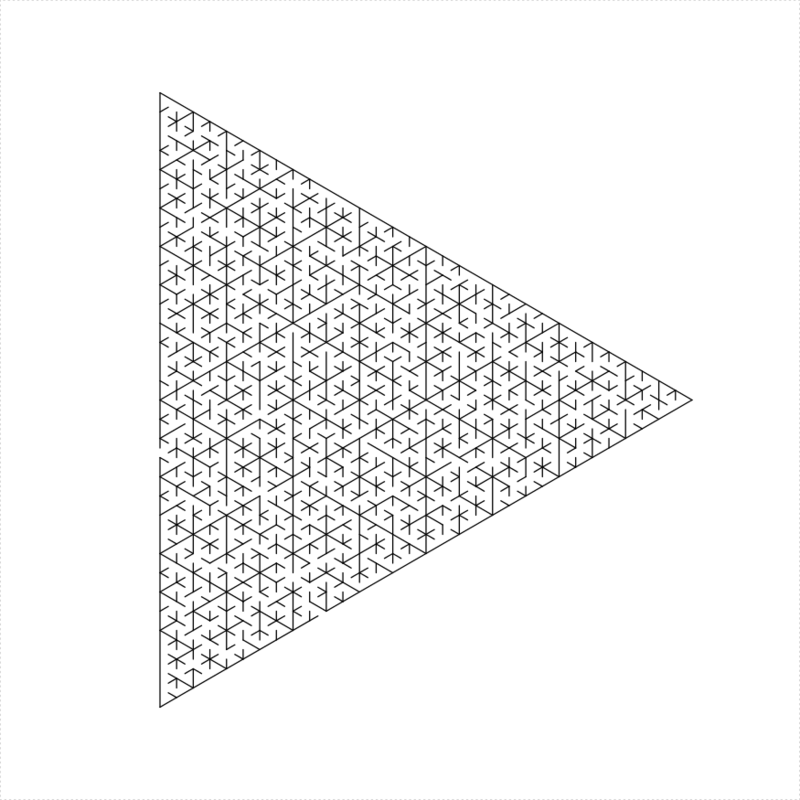 Supports the generation of parallelogram, equilateral triangle, regular hexagon, isosceles trapezoid, Koch snowflake, 'hexaflake', Sierpinski triangle, Sierpinski carpet and Sierpinski trapezoid mazes via 'TurtleGraphics'. 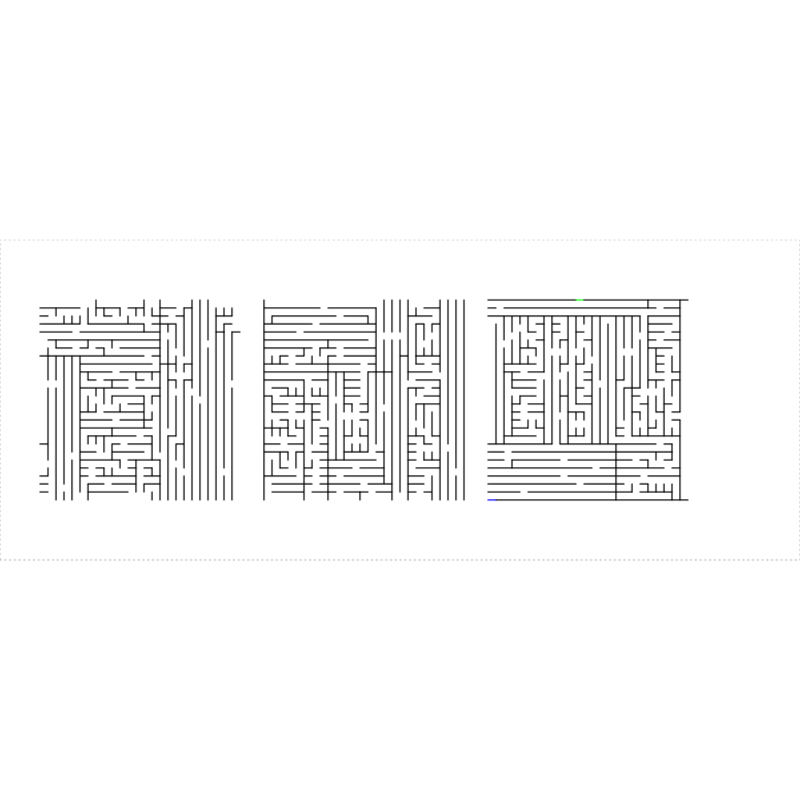 Mazes are generated by the recursive method: the domain is divided into sub-domains in which mazes are generated, then dividing lines with holes are drawn between them, see J. Buck, Recursive Division, < http://weblog.jamisbuck.org/2011/1/12/maze-generation-recursive-division-algorithm>. 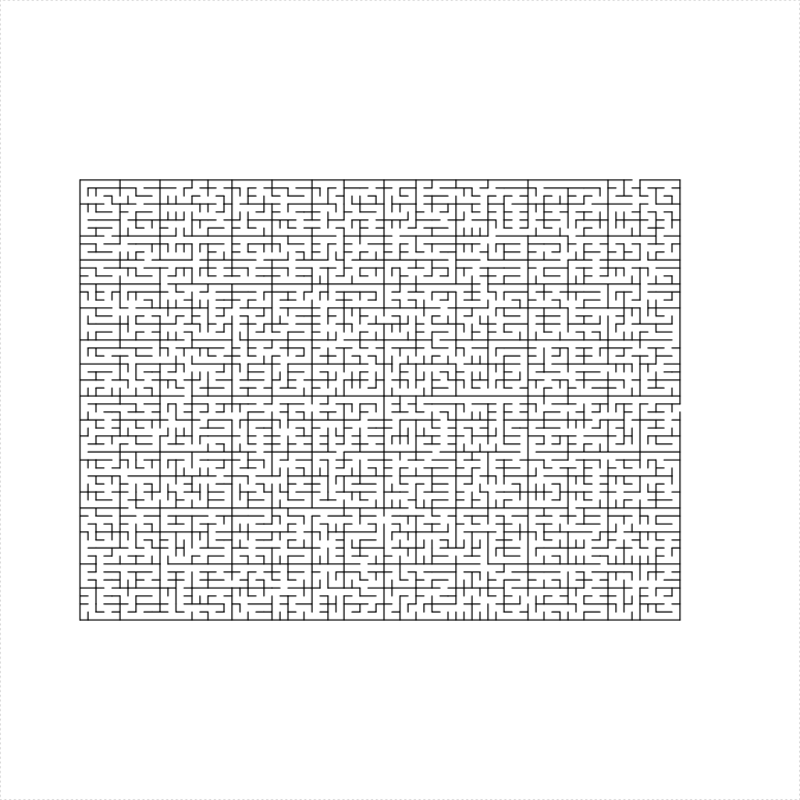 Generate mazes recursively via Turtle graphics. 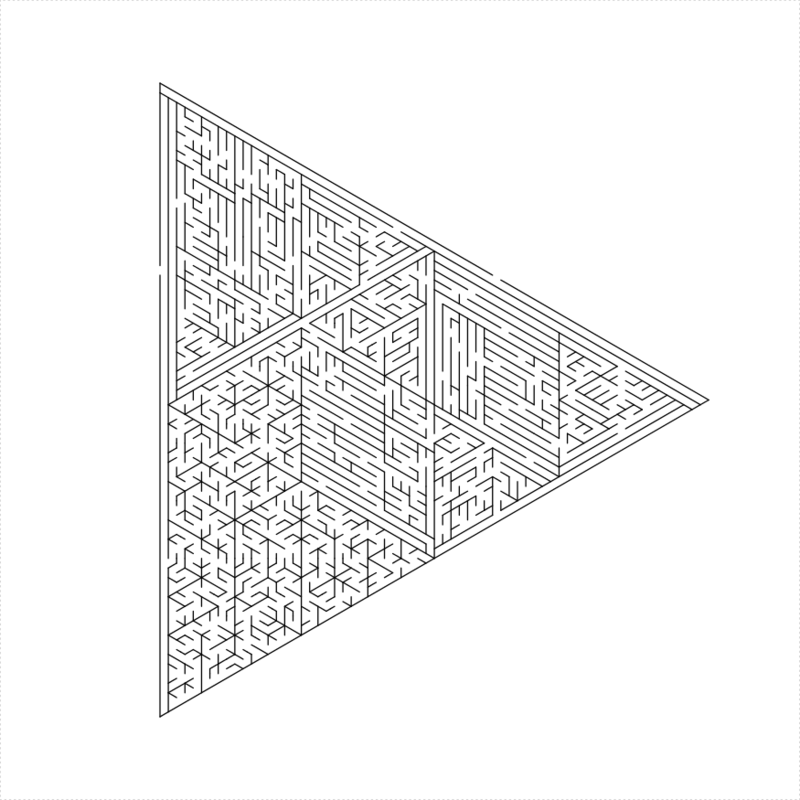 Create four equilateral mazes with lines with holes between them. 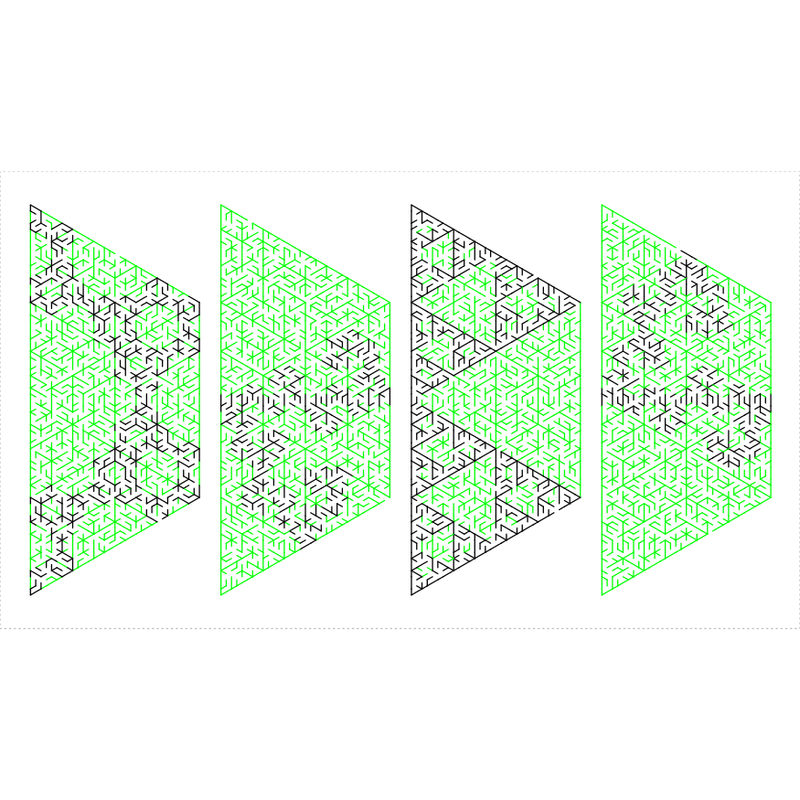 This only works if the side length of the original is a power of two. 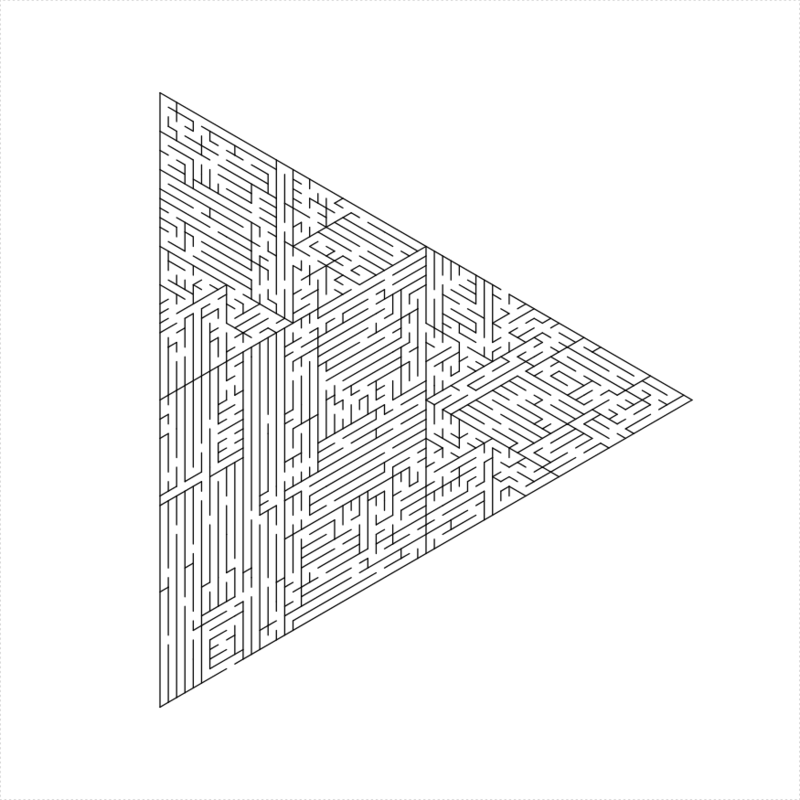 Cut out a parallelogram and attach two equilateral triangles. Again only if the side length is a power of two. 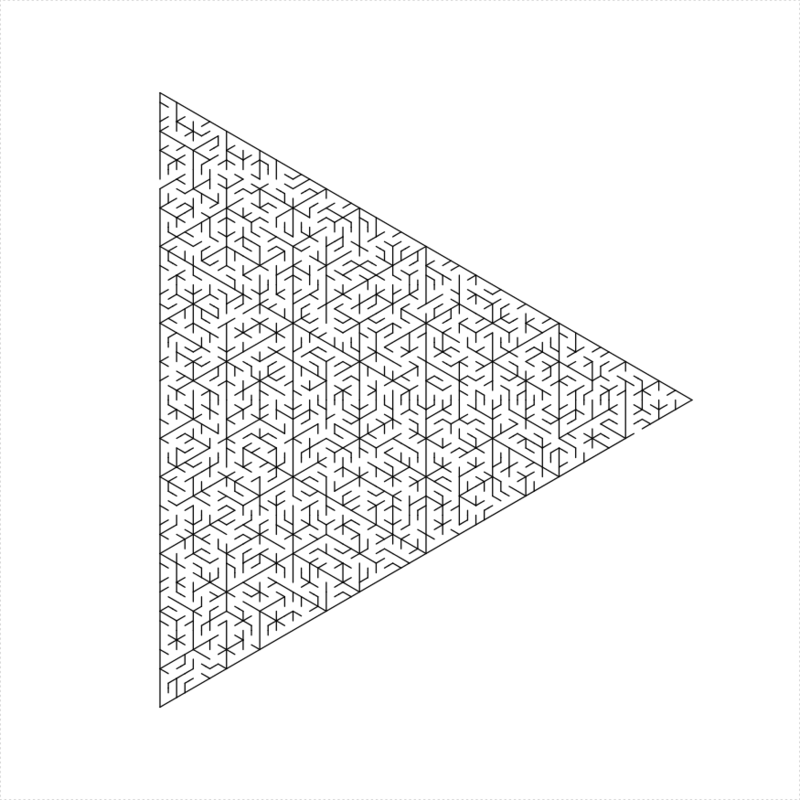 Create an isosceles trapezoid maze, then stack an equilateral triangle on top of it. This only works if the side length is even. 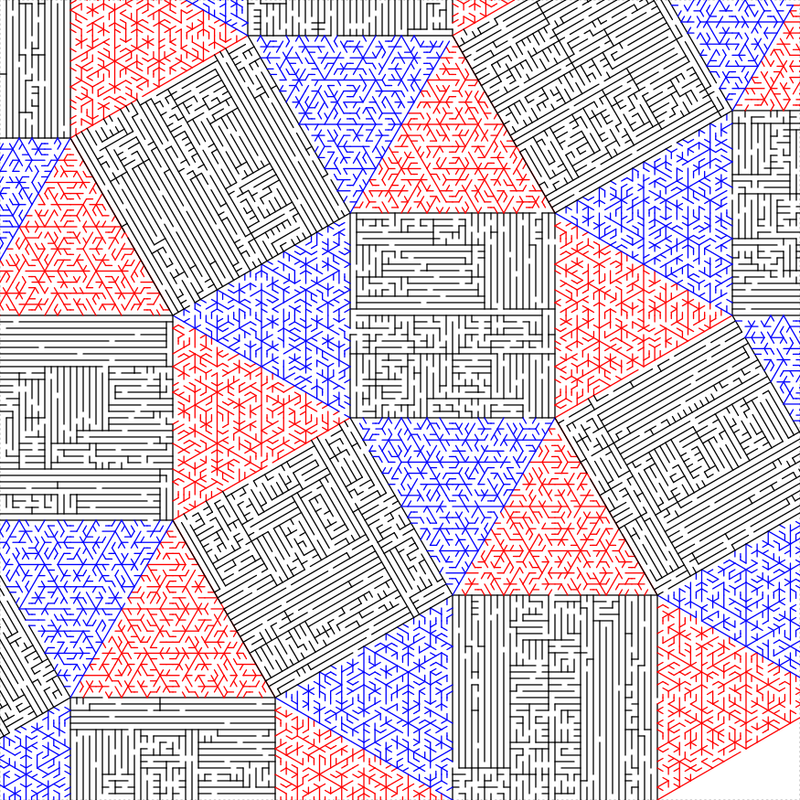 Create a regular hexagonal maze and three equilateral mazes in the corners. 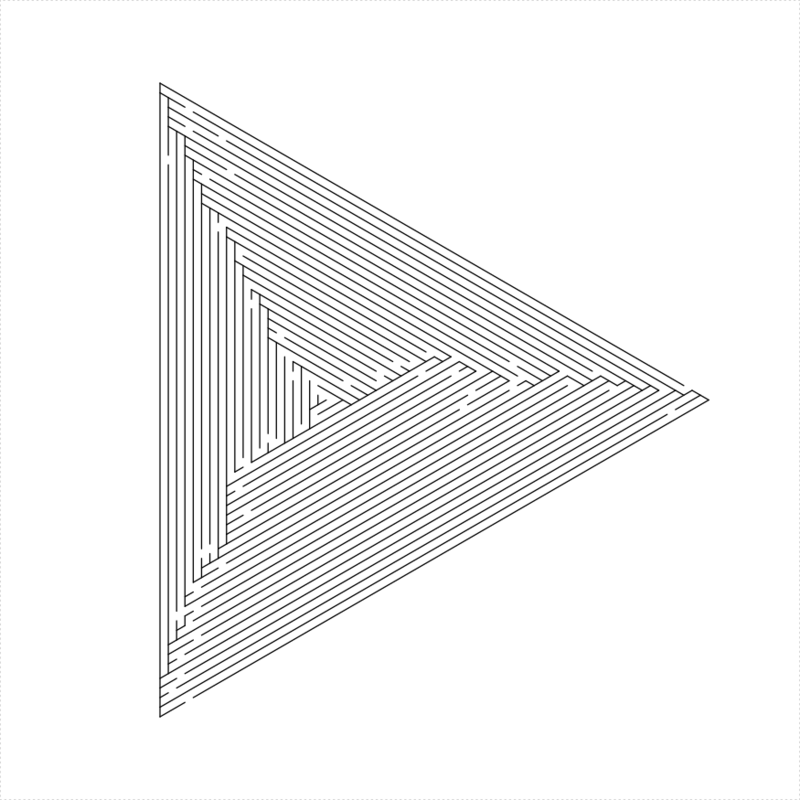 This only works if the side length of the original triangle is divisible by three. 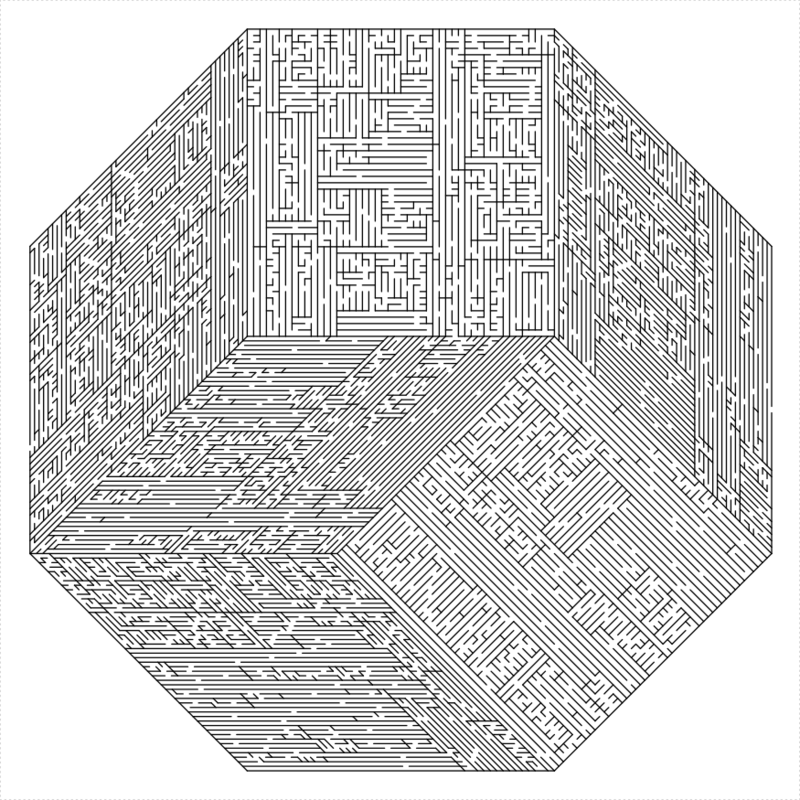 Shave off a single hallway and create an equilateral triangular maze of side length one less than the original. 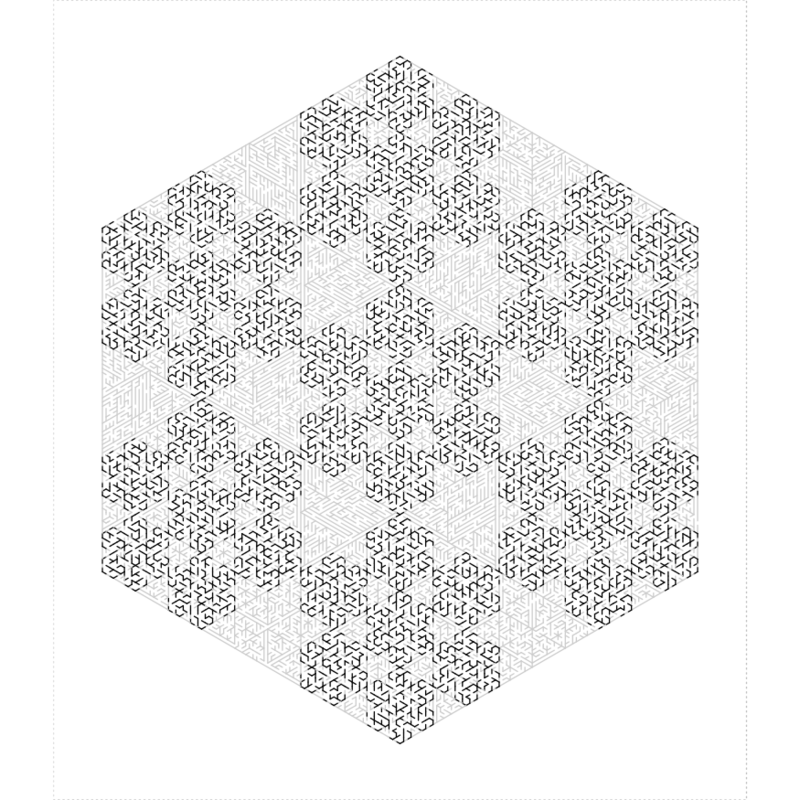 Decompose the hexagon as 6 equilateral triangle mazes, with one solid line and five lines with holes dividing them. 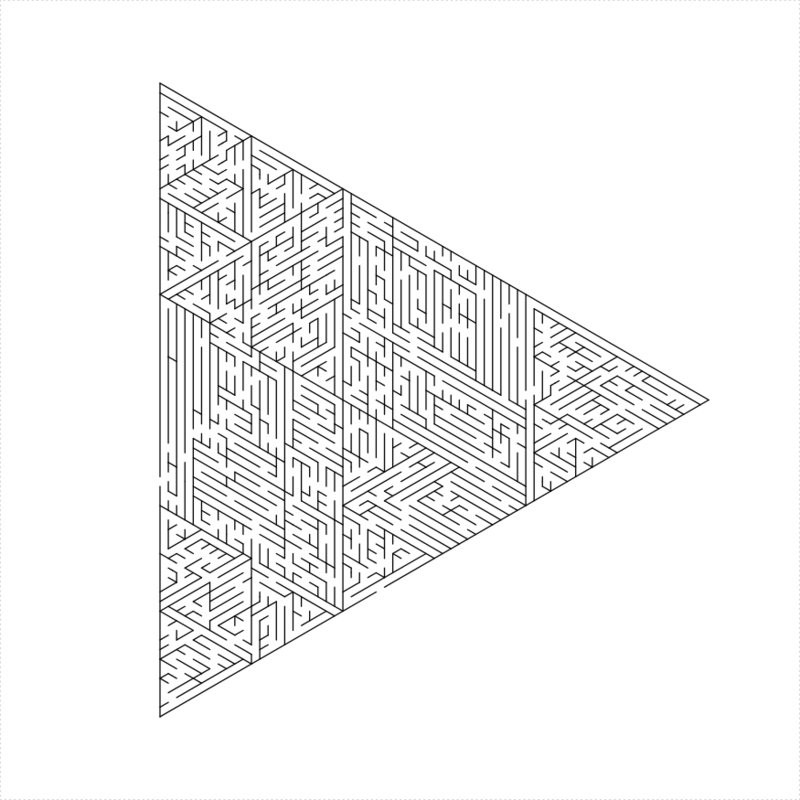 Create two isosceles trapezoid mazes with long sides joined by a line with a hole. 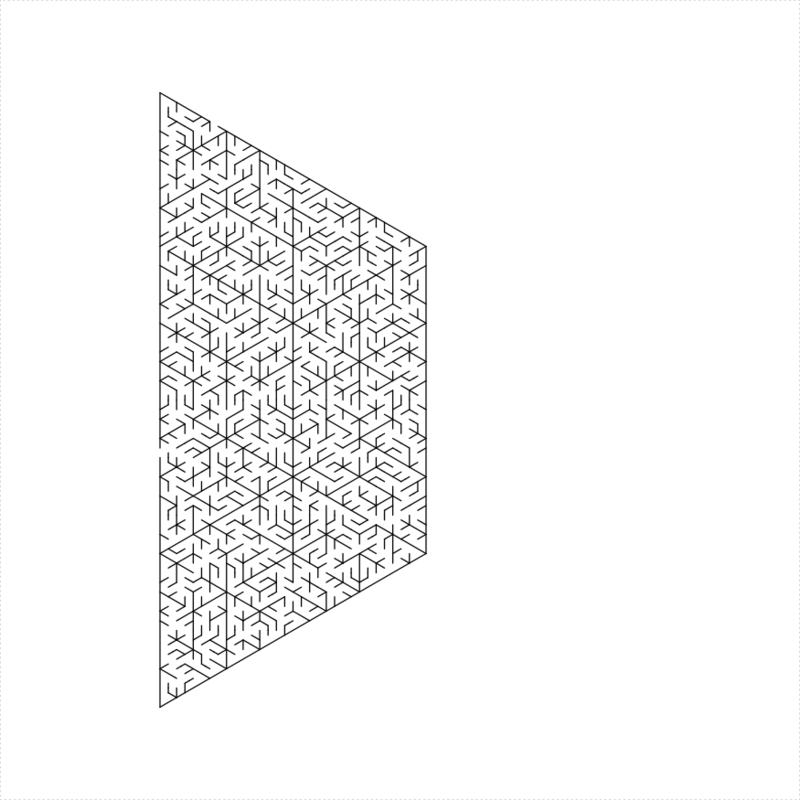 Create three parallelogram mazes with one solid line and two lines with holes dividing them. 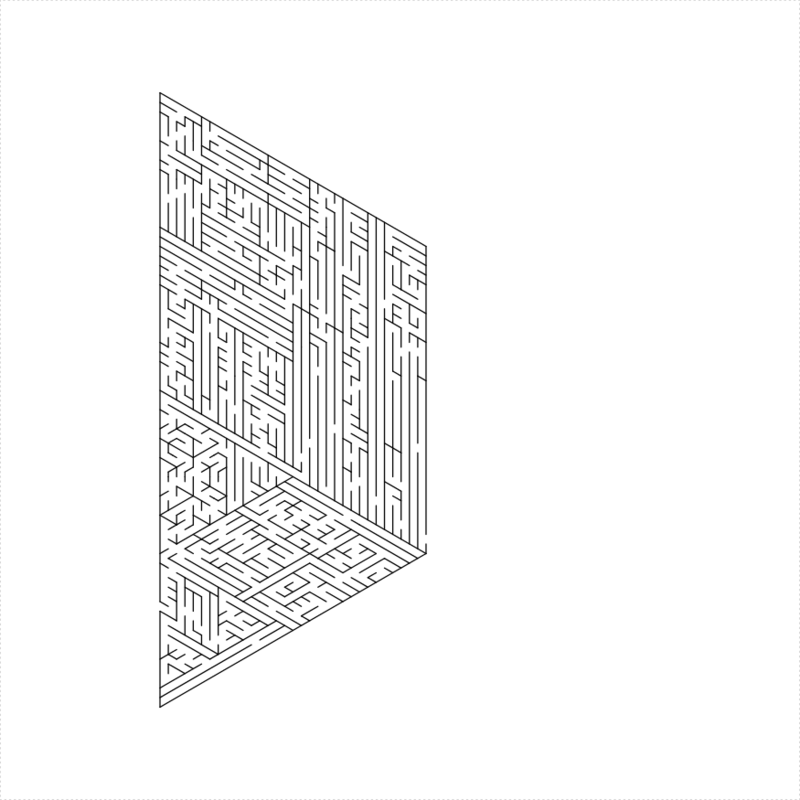 Decompose as four trapezoidal mazes with a 'bone' shape between them consisting of two solid lines and three lines with holes. 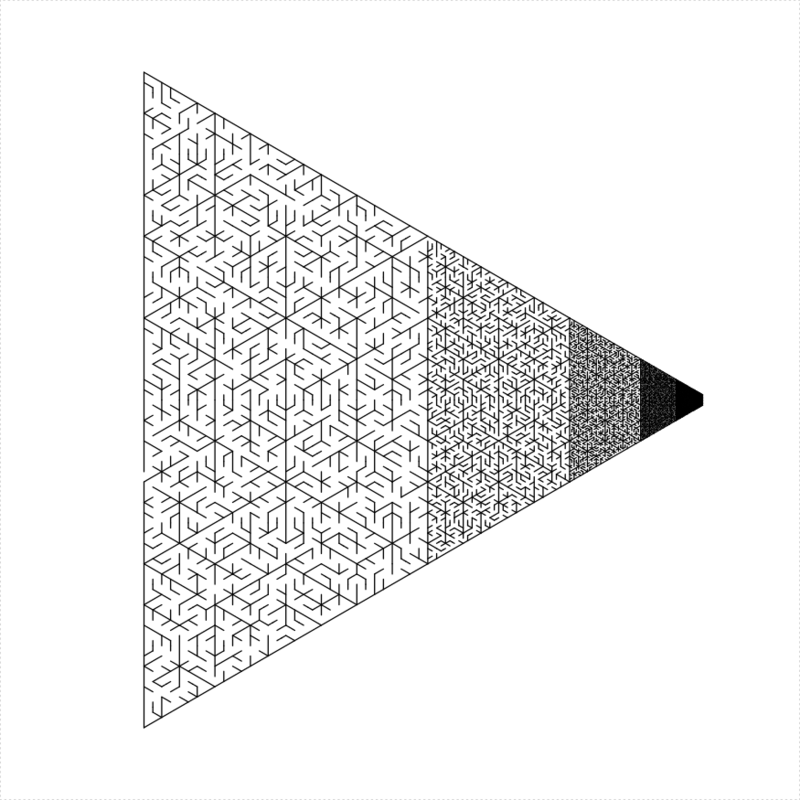 Regular 2n gons usually admit a dissection into rhombuses. 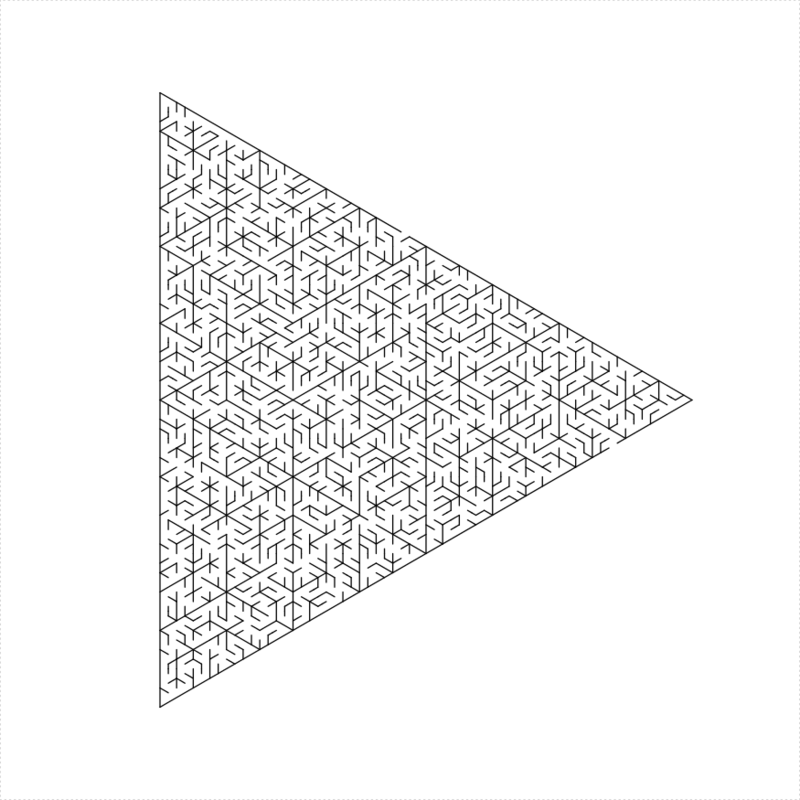 Sometimes, however, these have extremely acute angles, which do not translate into nice mazes. 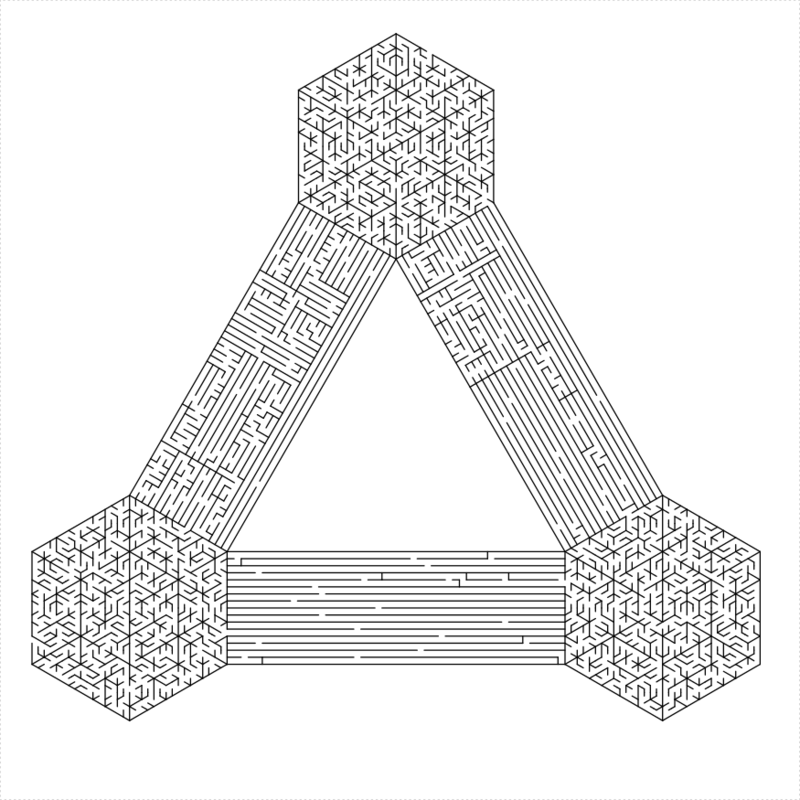 At the moment, there is only support for octagons, and decagons. 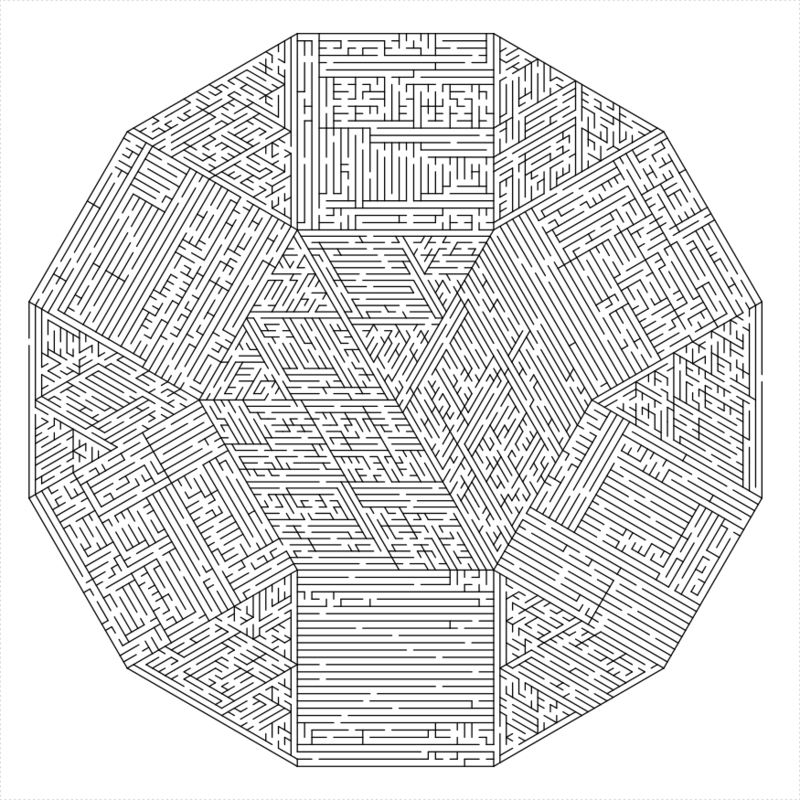 While a dodecagon would also admit such a dissection, this would require extremely acute angles which would make an ugly maze. 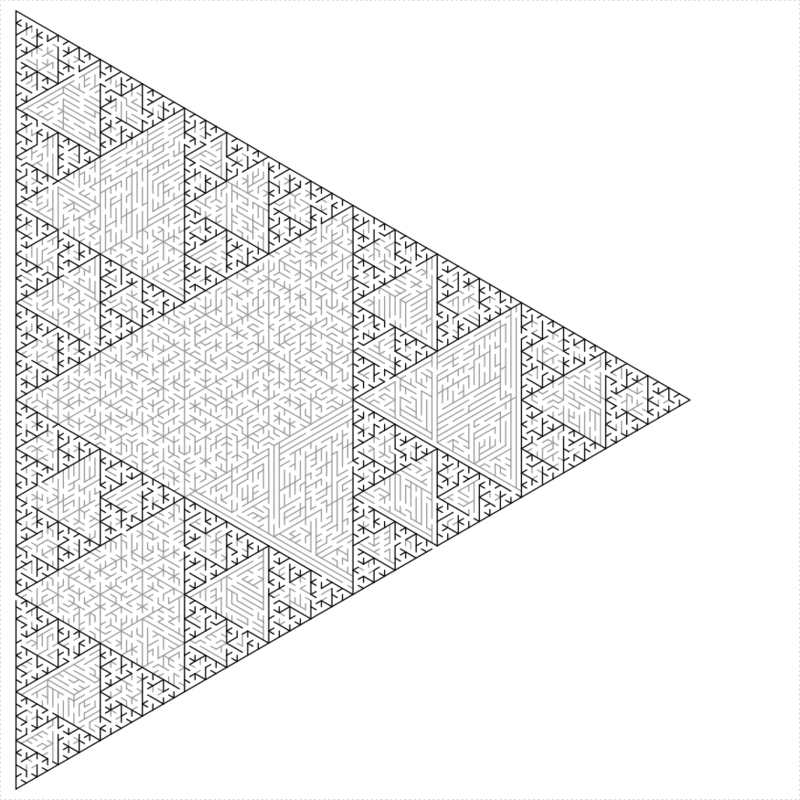 Similarly, one can construct a maze in a Sierpinski triangle. 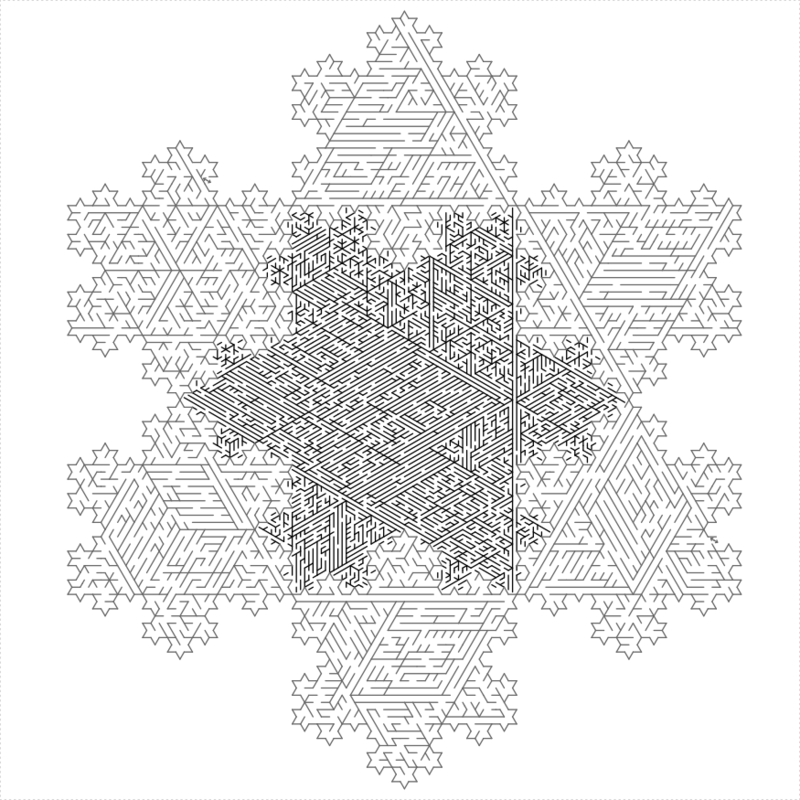 A hexaflake is a cross between a Koch snowflake and a Sierpinski triangle, at least in theory. 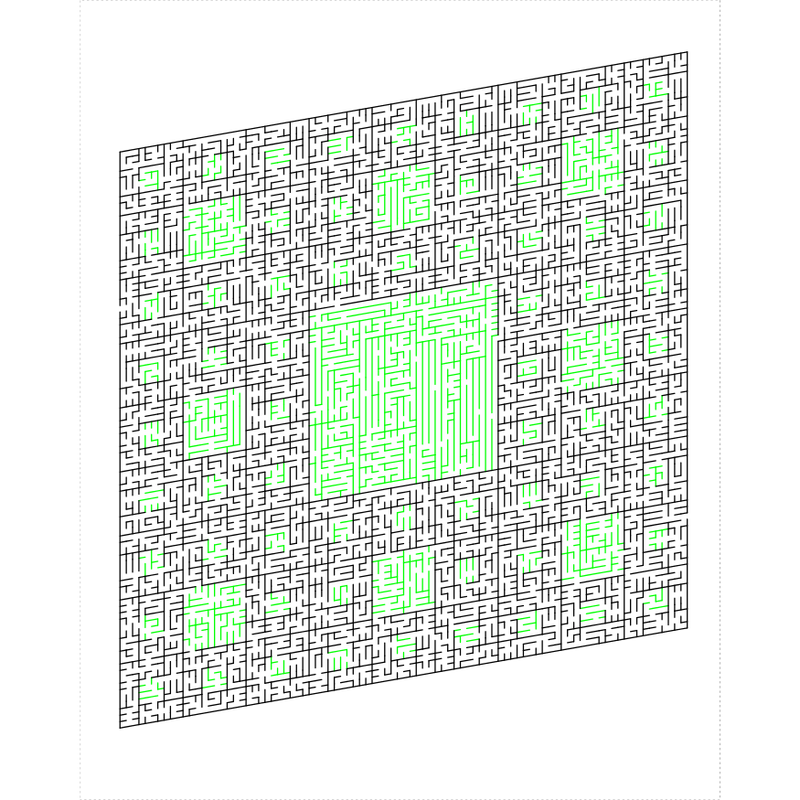 The parameters draw_boundary, boundary_lines, boundary_holes, num_boundary_holes and boundary_hole_color control the drawing of the final outer boundary of polynomial mazes. 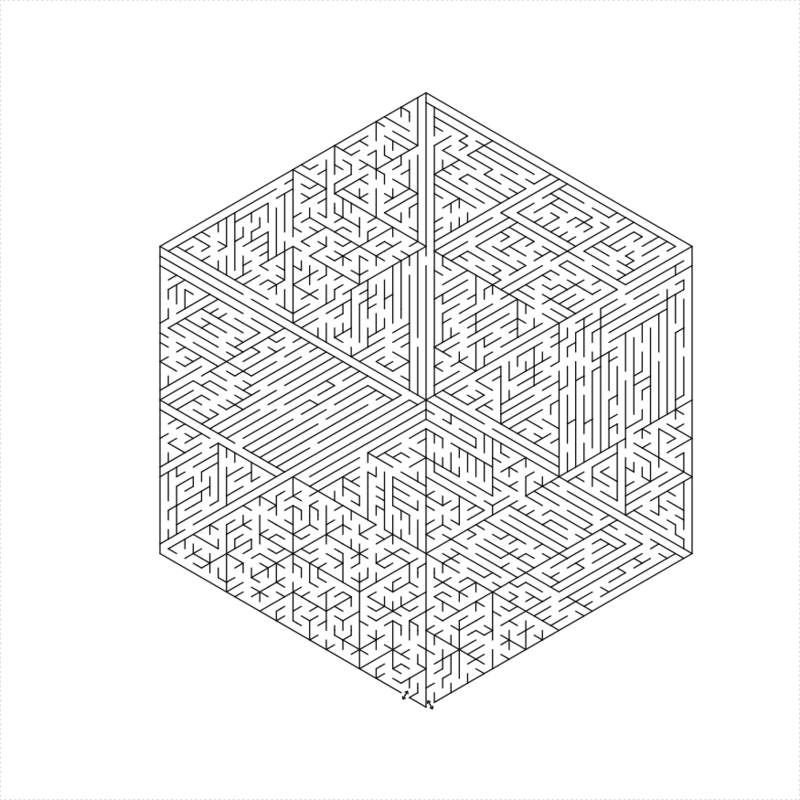 Without a boundary the maze can be used in recursive construction. 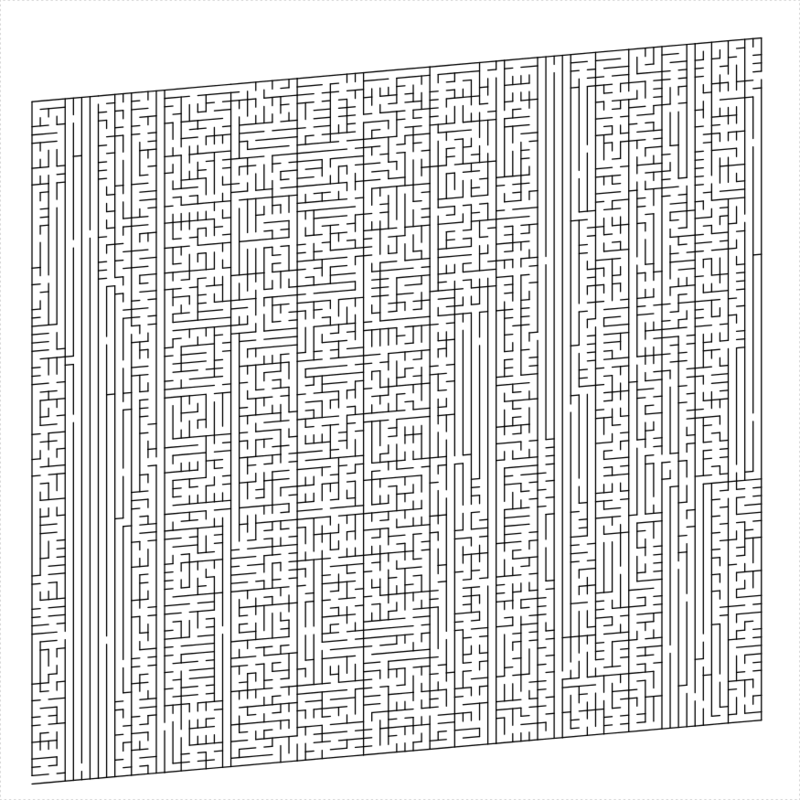 Adding a boundary provides the typical entry and exit points of a maze. 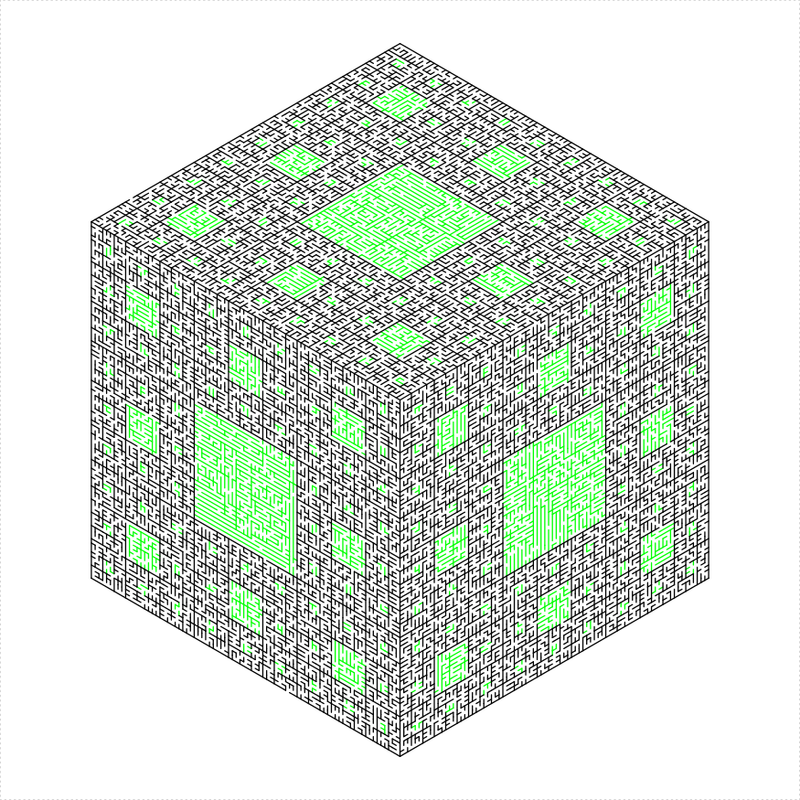 The parameter draw_boundary is a single Boolean that controls whether the boundary is drawn or not. 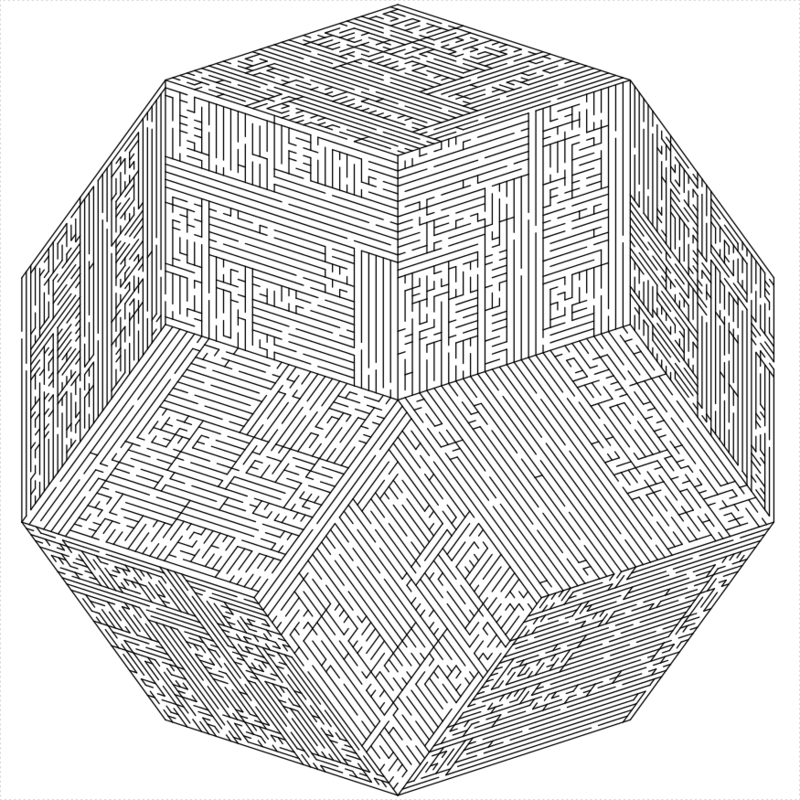 The parameter boundary_lines may be a scalar Boolean, or a numeric array giving the indices of which sides should have drawn boundary lines. 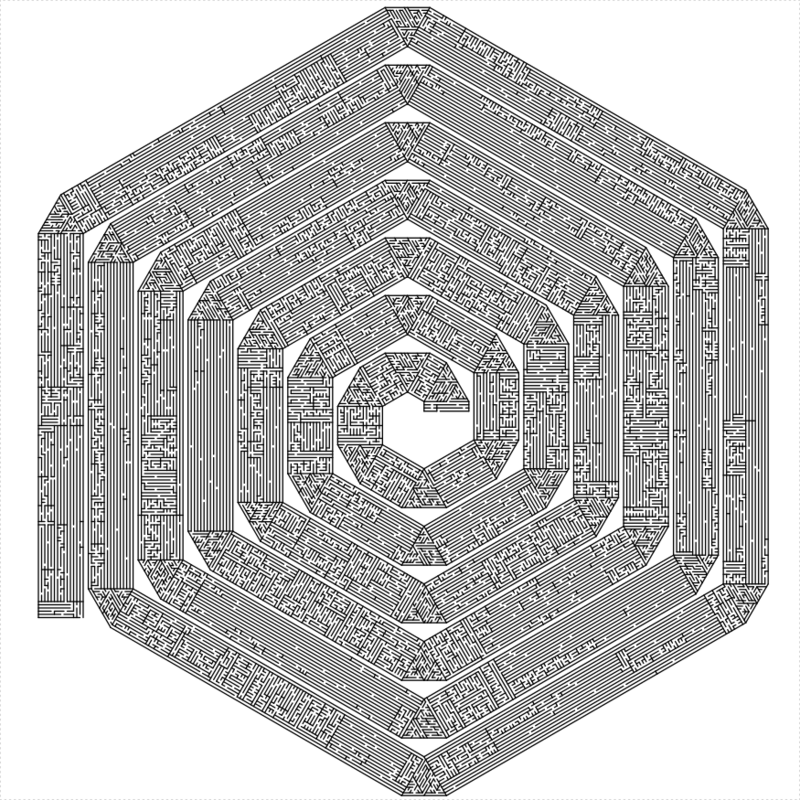 The sides are numbered in the order in which they appear, and are controlled by the clockwise parameter. 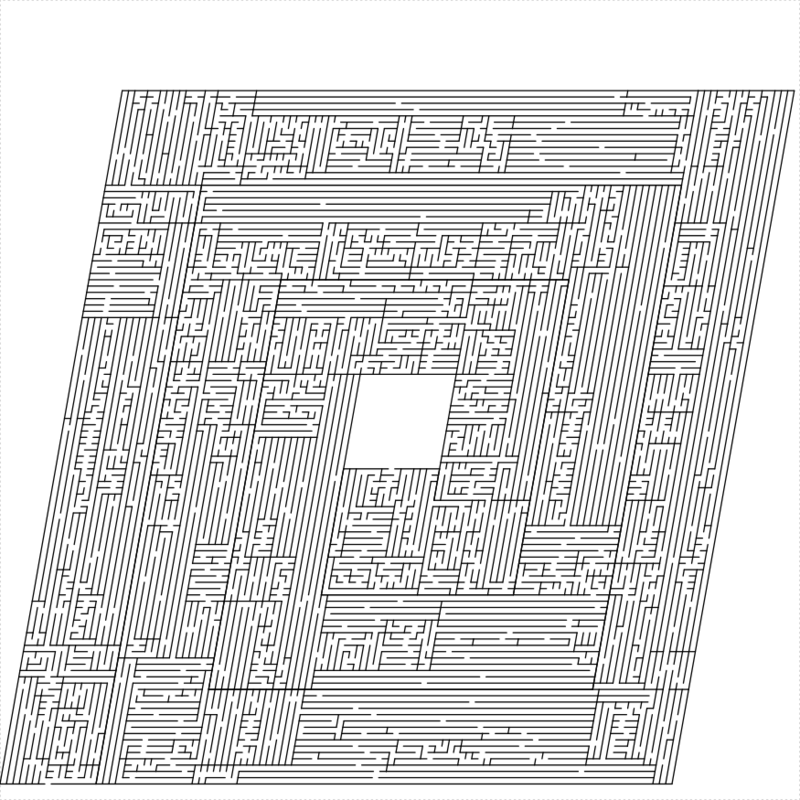 The parameter boundary_holes is a numeric array giving the indices of the boundary lines that should have holes. 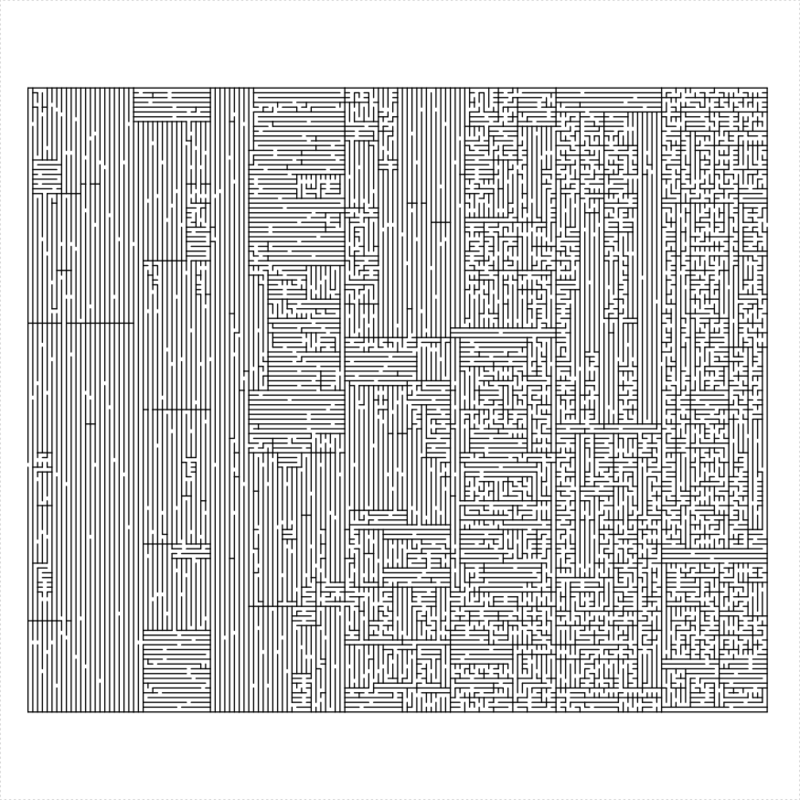 If NULL, then we uniformly choose num_boundary_holes holes at random. 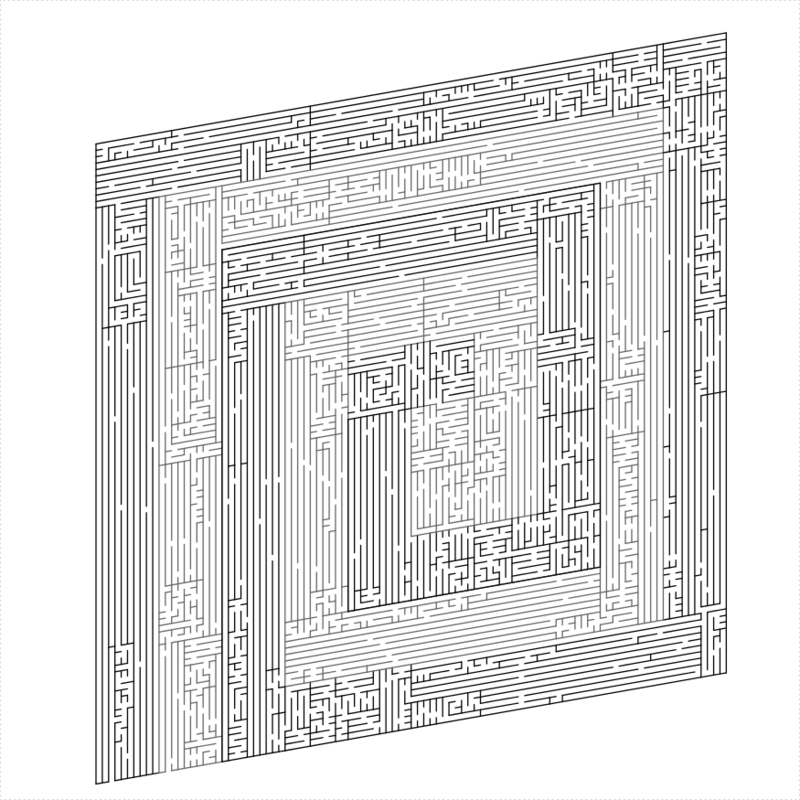 Holes can be drawn as colored segments with the boundary_hole_color, which is a character array giving the color of each hole. The value 'clear' stands in for clear holes. Or whatever you call it. 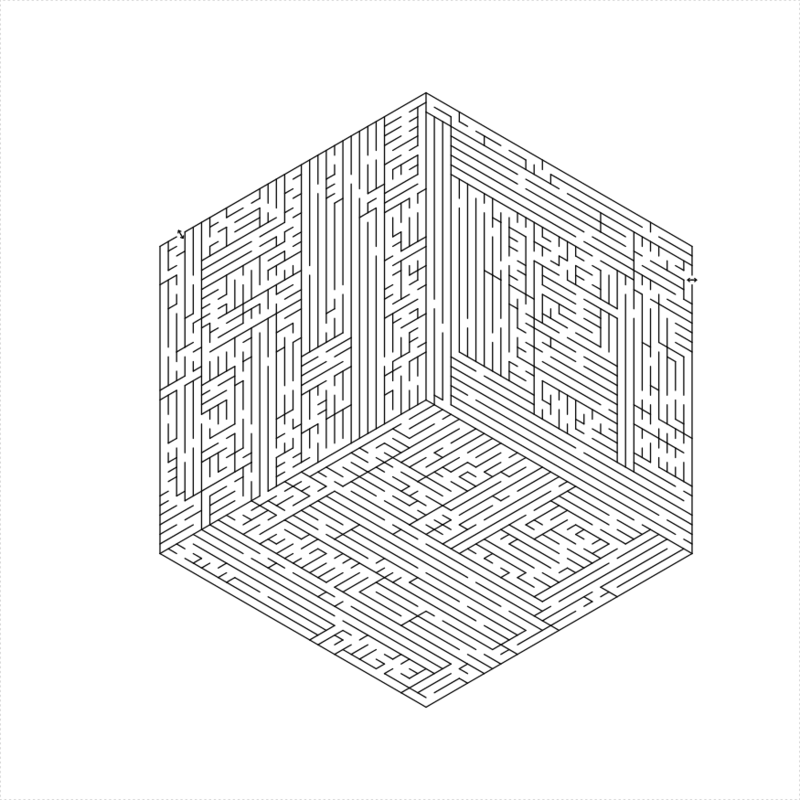 Here are some mazes built using the primitives. 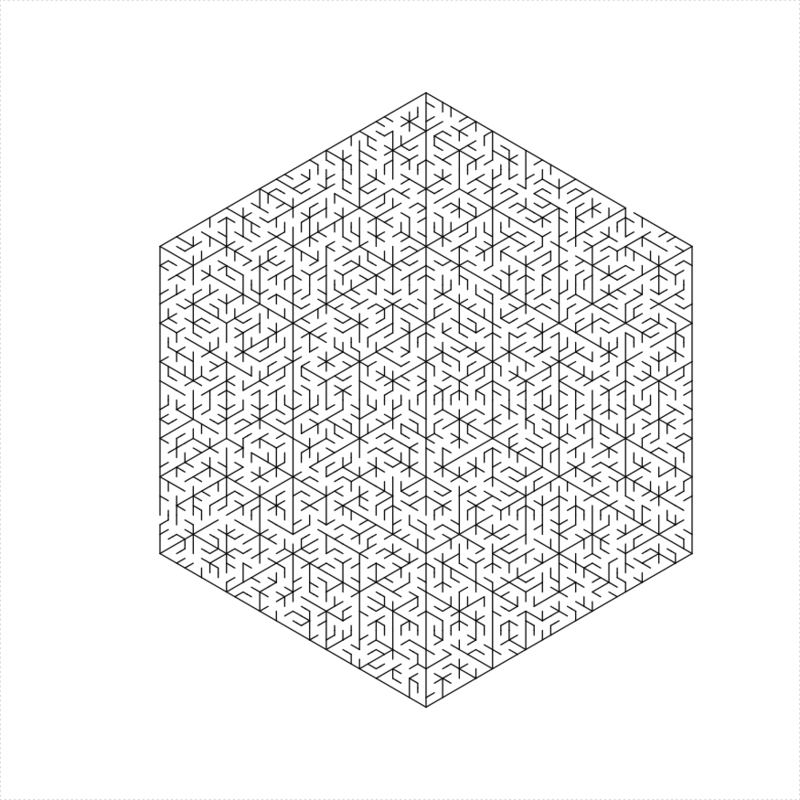 The path spirals in, then out, joining at the center. 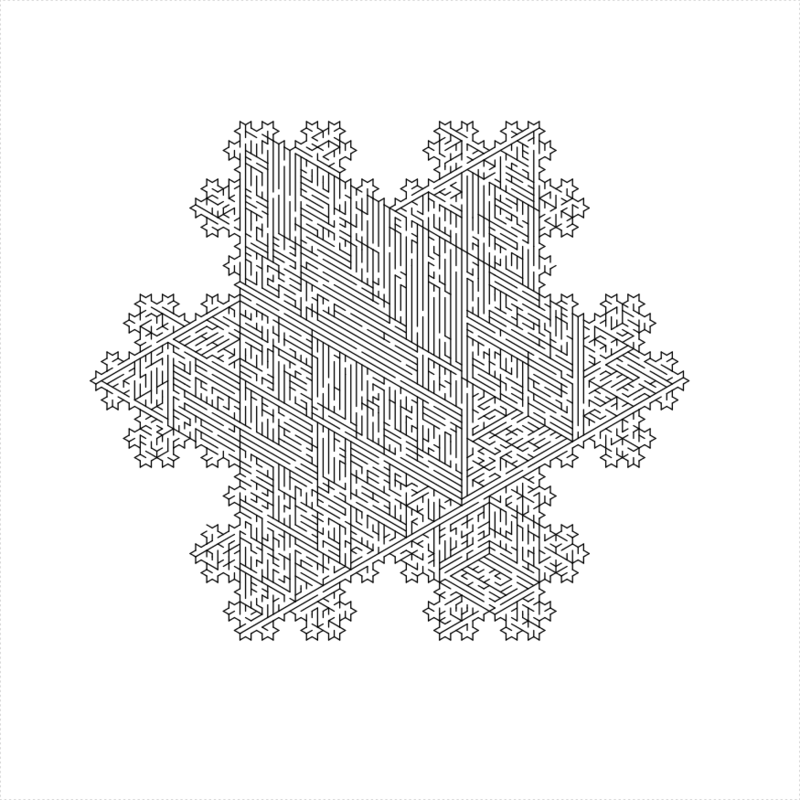 This might be buggy. 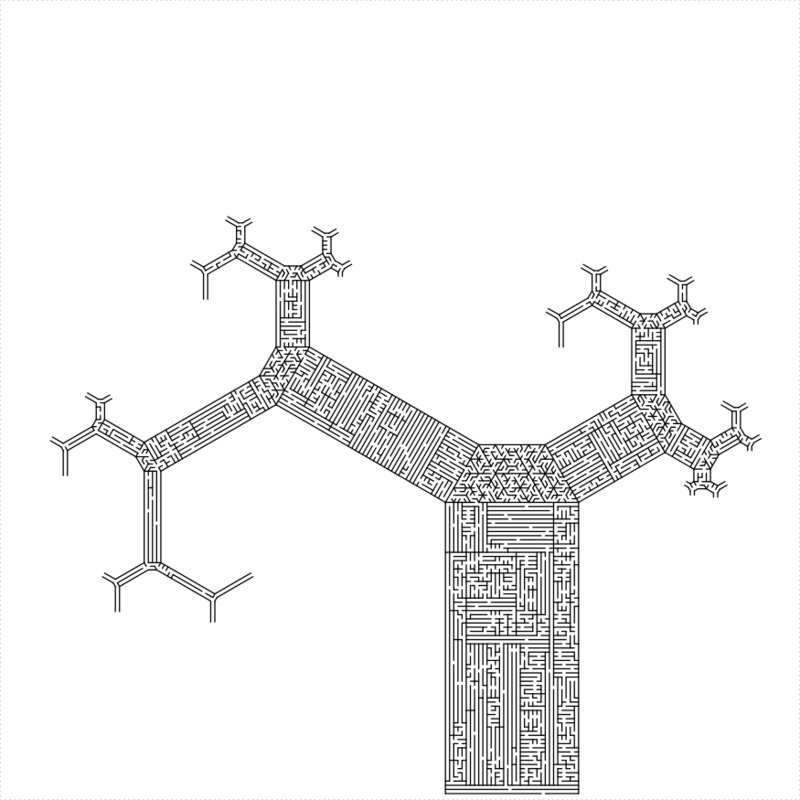 As in ox that plods back and forth in a field.